In a few days, we’ll invite friends to join our small family a the Thanksgiving table, and while we’ll serve Slow-roasted Turkey, Pumpkin Custard, Mandarin and Cranberry Relish and other seasonal treats, this year will include a new addition for the table that has quickly become one of my family’s favorite breads: Sourdough Maple Einkorn Dinner Rolls. Faintly tart, and mildly sweet, these dinner rolls are wonderfully soft with a tender crust and rich flavor – perfect buttered, or used to sop up extra gravy. We make them together, adding the ingredients to my big red stand mixer, and after the dough has risen, my little boy gently rolls them into little round balls that we place in a stoneware baking dish. Einkorn is an ancient variety of wheat, the original wheat. As a non-hybridized variety of wheat, it is often tolerated by those who are otherwise intolerant of modern, hybridized varieties of wheat; further, einkorn is richer in protein, phytonutrients and minerals than modern versions of wheat, and its flavor is complex and slightly nutty. High-extraction einkorn flour, in which some of the bran and germ have been removed by sifting, is an excellent replacement for all-purpose flour and it produces remarkable results in baking. You can purchase high-extraction einkorn flour, as well as einkorn berries online (see sources) as well as in well-stocked health food stores. Click here to check out recommended sources. While I love crusty artisan-style breads, I prefer dinner rolls to be tender and soft – pliable and sweet. To produce rolls with a soft crust and tender crumb, adding fat or egg to the dough helps, but the trick I’ve found to be most effective is to dampen a tea towel slightly with warm water and to lay it over the buns as soon as they emerge from the oven. This helps to ensure the crust doesn’t harden and the dinner rolls remain pleasantly soft. These Sourdough Maple Einkorn Dinner rolls are mildly tart, with a touch of sweetness added from Grade B maple syrup. They're tender and light, and excellent served with dinner or sliced open and buttered. Stir sourdough starter together with maple syrup, warm water and milk. Beat in the egg, and set the liquid ingredients aside while you prepare the dry ingredients. Dump the flours into the mixing bowl of a stand mixer, whisk in the salt. Equip the stand mixer with a dough hook, and pour the liquid ingredients into the dry ingredients. Mix the ingredients together on low speed in the mixer for 8 to 10 minutes, stopping the mixer from time to time to scrape the sides of the bowl, or until the dough is uniformly pliable. Transfer the dough to an oiled bowl, cover it tightly with plastic wrap, and allow it to rise until doubled in bulk - about 6 hours. Line a 9-inch by 13-inch baking dish with parchment paper. Punch down the dough, and separate it into 12 pieces of the same size. 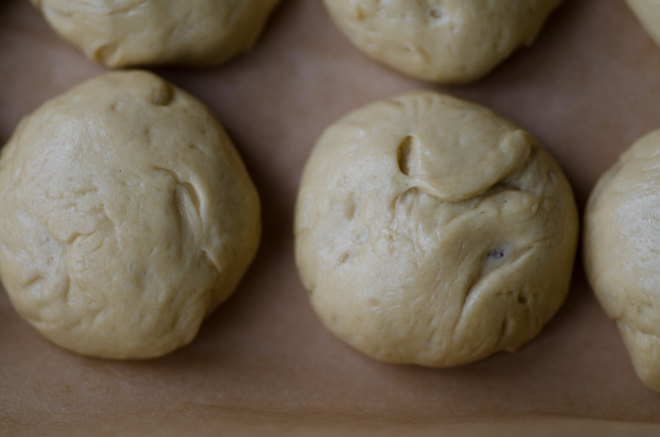 Roll the pieces of dough into round little balls, and set them into the baking dish. Cover the baking dish with a damp tea towel, and allow the dough to rise until doubled in bulk once more - about 2 hours. Make the glaze by whisking cream with 1 tablespoon maple syrup. Uncover the rising dough, brush them with the maple and cream glaze, and transfer the dish to the oven and bake them about 15 minutes or until golden brown and fragrant. Remove them from the oven. 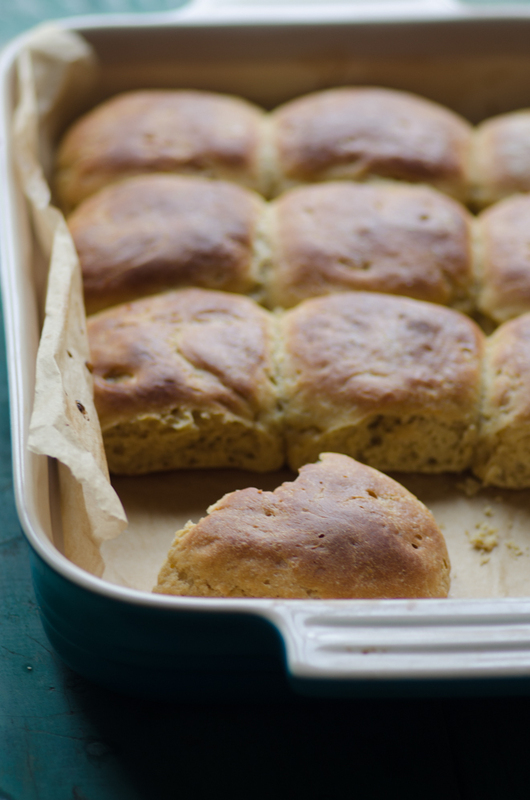 Place a damp tea towel over the baking dish, and allow the rolls to cool. Uncover the rolls, and serve. You can find high-extraction einkorn flour and einkorn berries here. To prepare whole grain einkorn flour, I recommend grinding einkorn berries in a grain mill or in a high-powered blender. Thanks for this, Jenny! Love my Jovial Einkorn flour & so does my starter! I don’t have whole grain or a mill, however. Have you tried this without the whole grain by chance? I bet you could just substitute the same amount of Jovial’s flour in place of the freshly ground flour for good results. I haven’t tried it, but I see no reason why it wouldn’t work. High-extraction flour has been sifted to remove some of the bran and germ. This prolongs the shelf life of the flour, and also makes for lighter baked goods. I use both Jovial’s high-extraction flour as well as their einkorn berries that I grind myself. I’m new to baking and about to make my first sourdough bread using einkorn flour, once all of my supplies come in the mail. Can you explain why you choose to use a combination of of high-extraction and whole grain flours (in this recipe and others) as opposed to just using one or the other? I appreciate your time in clarifying this :). I’m a huge fan, thanks for the amazing recipes! I’m doing a trial GF diet for a few months. I hate to ask since I’m sure you would have mentioned it if a substitution flour would work but do you think this recipe would work with other GF flours? I would recommend searching a gluten-free blog for a dinner roll recipe. Gluten-free Girl has wonderful recipes. Jenny, what do you think about using all whole grain Einkorn? I buy mine from growseed.org and hers is whole grain. Any changes you would recommend making in that case? These were awesome, Jenny. 🙂 I did an egg wash + the cream & maple syrup on top and they were shiny, soft and delicious. 🙂 Thank you for the great addition to my baking recipes! Also, I made them again using half organic all-purpose, half (sifted) sprouted spelt, reduced the water by 1/4 c, added an egg, and used the egg wash… And it was still tasty! 😉 I always appreciate the adaptability of your recipes. Thank you! I’m SO glad you liked them, Meg! I think the addition of an egg wash was a good call – might do that when I make them for Thanksgiving. Dumb question but I do not have the fancy flour- would unbleached all-purpose substitute alright? You could try and see? Most baking is very forgiving! Happy Thanksgiving. Just in case you’re checking comments today, I’m starting this recipe right now and I can’t see where I use the butter. Does it go in with the starter/water/milk/eggs mixture? I’m going to just do that because I’m pretty sure that’s where it goes. I’ll check back in case you answer in time. 🙂 Thanks for this recipe- great tip on keeping them soft. I can’t wait until dinner to eat them!! I made these last night- they were a little too soft and didn’t hold their shape like the rolls in the picture. But they are delicious! Especially the glaze, I just want to eat the tops off of them! Thank you for the recipe. I can’t wait to give it another go and see if I can make mine as pretty as the ones in your picture. 1) bake them Wednesday and reheat them right before the meal – how are they a day after being baked, do you know?? 2) mix and proof the dough Wednesday, form the rolls and let rise for half the time or so, then stick in the fridge overnight and bake either Thursday morning before we leave home, or bring to bake at our friend’s place right before serving. Would you please let me know what you think is the best approach, according to your experience with the recipe? Thank you! 1. I only had 1 T. of maple syrup, so I used 2 T. honey with it. 2. My dough hadn’t risen to double after 9 hours, so I put it in the fridge overnight. I took it out the next AM, let it rise in a warm oven, and also let the formed rolls rise in a warm oven. 3. I didn’t want a sweet top on them, so I just brushed with 1 egg mixed with a little cream. 4. I made them a little smaller and got 15 rolls – good size for us. I froze them for Thanksgiving, but we tried 2 tonight with our soup; they are FANTASTIC! Oh, and I used all high extraction einkorn flour. Made and so enjoyed.Thanks Jenny! Can anybody clarify where the butter listed in the ingredients comes into the recipe? I am assuming that this gets included with the wet ingredients before the egg, but maybe it is meant for oiling the bowl? Yes! I just made these and “forgot” to add the butter because it didn’t specify where! I have it rising now… hope it turns out ok! I am thinking maybe the butter was to oil the bowl? Or included in wet ingredients? yikes! I hope they are ok!